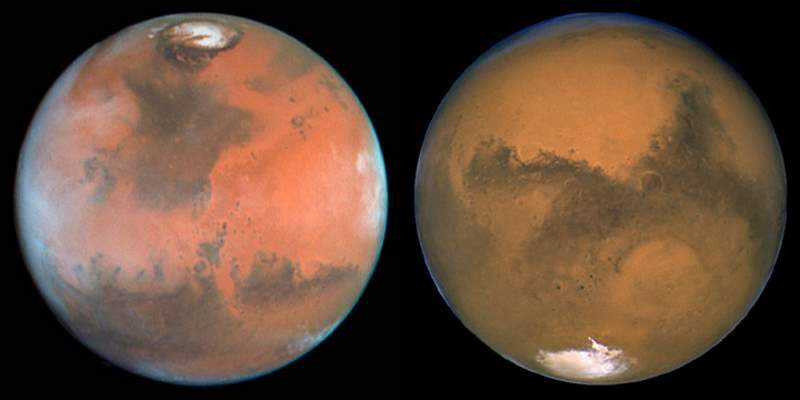 The planet Mars has two permanent polar ice caps. During a pole’s winter, it lies in continuous darkness, chilling the surface and causing the deposition of 25–30% of the atmosphere into slabs of CO2 ice (dry ice). When the poles are again exposed to sunlight, the frozen CO2 sublimes, creating enormous winds that sweep off the poles as fast as 400 km/h. These seasonal actions transport large amounts of dust and water vapor, giving rise to Earth-like frost and large cirrus clouds. Clouds of water-ice were photographed by the Opportunity rover in 2004.